As in the play, I too once experienced a relationship in which a lover (ex, we’d broken up a few years prior) had succumbed to AIDS. I also had to deal with that ex’s mother (embodied exquisitely as a frozen-by-fear matron in the person of Tyne Daly), a woman emboldened by fear and small-mindedness. Her attachment to her only son walked a tightrope between love and the maniacal control she wielded until her son gasped his last breath. Mothers and Sons captures a moment of reckoning. Daly’s mother comes to visit her son’s ex at his New York Central Park West apartment on a winter’s day twenty years after said son’s death. What follows is a dance of coming together and pulling apart: secrets are told, anger explodes, myths and stereotypes are refuted; mother and ex spar, console, accuse and retreat. McNally deploys his trademark humor, but there’s heartbreak, too: both the characters and audience members old enough to have survive must relive, and make peace with, the pain of the past. “You think your children will save you,” utters Daly, as she observes Cal (played by the laconic, stalwart Frederick Weller) play out a notion of gay familyhood with a younger man and their son, an unthinkable scenario back in the dark days of the crisis. She warns him what a mistake that is, and I couldn’t help think of my faux-mother-in-law, a woman who pinned every aspect of her fulfillment on her one child. It made me remember how that tragedy had as much to do with the destruction of expectations as it did untimely death: how you expected your life to flow; how you assumed that, in the face of catastrophe, our best selves would emerge. As wrought by McNally, survivors were, and continue to be, devastated by a disappointment indivisible from grief. Mothers and Sons isn’t perfect; it’s ultimately messy and, as some have said, a touch contrived. 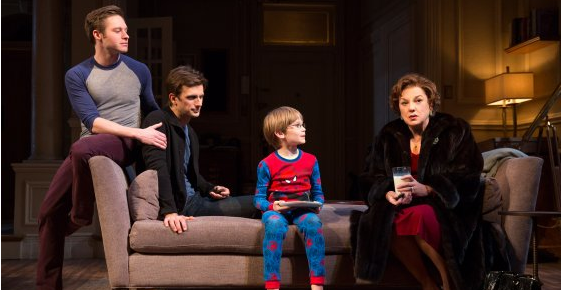 Maybe its attempt to shoehorn the entire history of gayness in America into its 90-minute minute should be reconsidered (though we need to be reminded that the happiness of the family at the play’s center is hard-won). Its strengths lie in emotional truths that feel as real as my experiences, or that of the sniffling chorus who surrounded me in the theater. The play’s staunch refusal to provide resolution is probably its most moving aspect. I don’t know if my faux mother-in-law is still alive, but I often wonder what I’d say to her if we met again. I’ve lived with this unfinished business for over 20 years, but given all I’ve learned, the things I’d express would echo McNally’s words. To him, my thanks for giving it voice.